Jewelry Designs That Will Enthuse Even the Most Uninspired! Free thought, independence of spirit, and a rebellious nature. These are just some of the qualities nurtured by this exceptional school whose graduates have gone on to be world leaders in fashion. As jewelry designers, artists and creative people, I’m sure you’re always striving to design fresh and new ideas to your line. Expanding your horizons, evolving, and relentlessly pursuing your passion. Those are some of the reasons why being creative is so darn fun! Here are a few examples of jewelry designs that push the limits and dare to be different. I hope they arouse your creativity to new heights and ever new possibilities! I find that these jewelry designs have somewhat of a chaotic nature. They combine many different elements together such as the Swarovski Mosaic stones, different shaped cup-chains, along with unique styles of beads, pendants and colors. Yet with all of this going on, if you look closely you’ll find that they are balanced out by a repetitive pattern. This duality is balanced very well and is a way in which you can expresses a real sense of creative wildness, while still maintaining its integrity and orderliness which so many people are naturally drawn to. 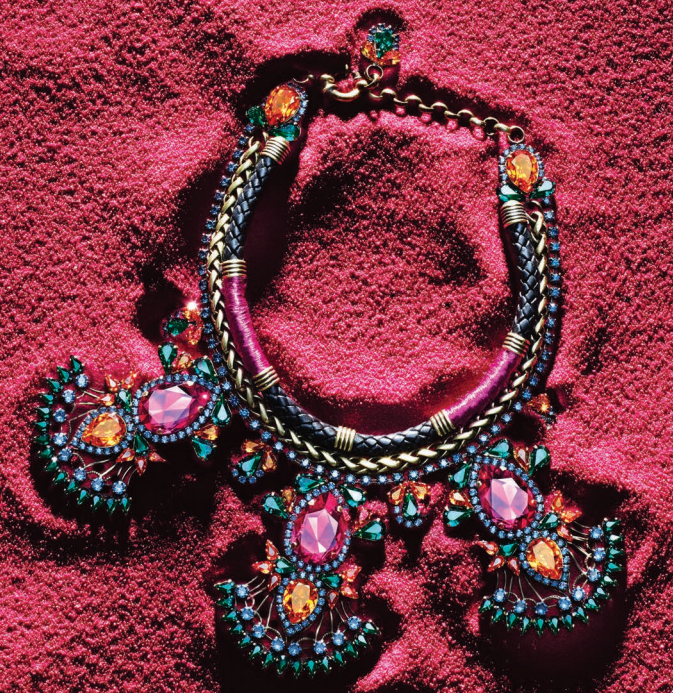 This unique bib necklace is a outstanding example of weaving mixed medias in and out to create one dynamically dramatic design. Integrating different textures such as Swarovski Pearls, Swarovski Crystals, Epoxy Clay (or Ceralun), ribbon and elastic mesh in complimentary colors creating an overall irresistibly enticing design. This colorful crystal and braided leather bracelet features many different styles of crystals in metal settings which allow the crystals themselves to be showcased. I’m especially drawn to the overlapping look, it gives it a lively and energetic type of movement to the piece that is then grounded by the leather background. It’s a bohemian chic style that is both whimsical and substantial at the same time. Best wishes for an exceptionally creative day!! Jeanine from Joy from the Heart has been making jewelry and sun catchers since 2002. It all started when she received a sun catcher as a gift. It meant so much to her and she wanted to bring that enjoyment to others. Jeanine started with making the sun catchers and soon friends were encouraging her to make jewelry. Creating the Guardian Angel sun catcher and hearing from the customers about how they are enjoyed means a lot to her. This stunningly eye-catching Swarovski Crystal AB bracelet features a secession of three 5601-6mm Crystal AB Cube Beads stacked on top of each other incorporating the 5822-19mm Silver AB Bar Rondelles as spacers. This luxurious crystal bracelet exudes glamour and sophistication, a perfect center piece for a celebratory event such as a wedding or gala that will truly wow admirers. This refined Swarovski Crystal necklace features a graduated design of 5601-4mm, 6mm and 8mm Sapphire Cubes and sterling silver spacer beads. This beautiful design is available in many different colors to accommodate your specific desire. This amazingly brilliant but simple pendant, can be custom made specifically for you, your mother, grandmother, friend or relative. Jeanine strings together Swarovski Crystals matching the person’s birthstones onto a beautiful sterling silver head-pin, separated by gorgeous squardelle crystals. Jeanine’s embellished watch collection includes gold or silver, square or round watch faces with handmade bands using various colors of the 5601-4mm Swarovski Cubes beads and sparkling Bar Rondelles. These one-of-a-kind watches transform a normal watch into a piece of beautiful jewelry and are available in a variety of rainbow or single color options. This simple and refined Swarovski Crystal earrings feature the 5601-6mm and 4mm Crystal Bermuda Blue Cubes accentuated by a silver crystal Squardelle. Thees dainty stylish crystal earrings are versitile and can be worn as an every day pieces, to the office, a night out on the town or to an upscale event. It is important to Jeanine to create great pieces that everyone will love. Unique pieces that you cannot find anywhere else. It is her goal to send the customer home with a product that will put a smile on their face each time they look at it. Focusing on an exciting, eclectic blend between African and Asian cultures,the Progressive theme highlights the union of both. Medium and large crystals highlight the eclectic look of the theme. 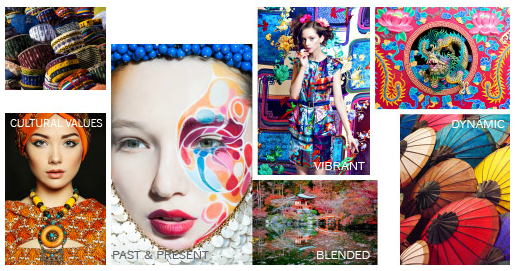 A broad spectrum of colors and shapes reflect a joyful celebration of life. 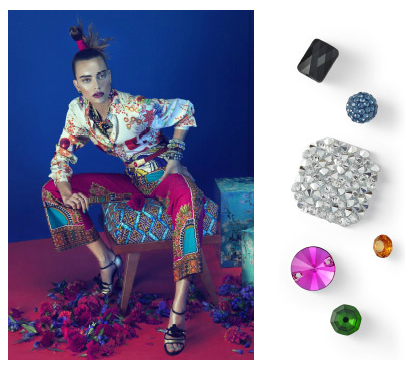 Vibrant Fancy Stones and Pendants create attention-grabbing, culture-merging color palettes. Pavé Balls, with their shimmering radiance, add edge and sophistication to the design. Various geometric shapes enable the creation of unexpected patterns. This new alliance between Africa and Eastern Asia is having a huge influence on the design world, seen in the rediscovering of their beauty, craftsmanship, and individual aesthetic. The theme reflects both a joyful celebration of the past, and the way forward. A unique, eclectic, and multilayered style that reflects the blend of traditional African and Asian craft and handwork techniques. A mix of materials – Swarovski Crystals, Pearls, Beads, textiles, and metals – combine to create rich 3D surfaces with sculptural aspects. 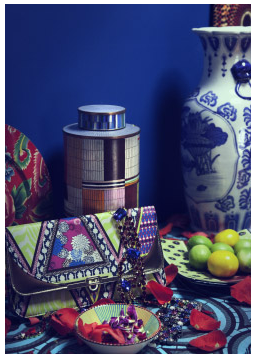 A focus on layering, where Asian and African patterns combine with crystal to create unique patchwork, creates a cross-cultural design ethic. Flat fabrics come alive with a focus on volume, texture, and tactility. The importance of head-wear, both in Asia and Africa, gives rise to a new accessories direction – the reinterpretation of the turban. Fabric becomes important in accessories for cost reduction and global production. Topaz is celebrated this month as the gorgeous birthstone color for November! Topaz is traditionally distinguished by a rich and elegant gold tone. It’s mesmerizing amber hue seamlessly blends a burnt orange with a soft honey color together creating a stunning effect that looks as though it is glowing from within. Featuring Swarovski BeCharmed Pave Beads in November’s Birthstone Color Topaz. The various styles include 80101, 80201, 80301, 5928 and 5948. Topaz is a luxurious color that is an exceptionally popular tone throughout the year and especially ideal in the fall months where the natural beauty of leaves turning, pop with brilliant yellow, gold and red tones. Featuring Swarovski Earrings using Style 6090 16mm Baroque Pendants in Topaz with a Glacier Blue Coating wrapped with gold-colored artistic wire. The Swarovski Topaz color can be accentuated with special coatings that either enliven or tone down the original Topaz color. Topaz AB is the most popular coating , which compliments the color by infusing more yellow and gold tones, enhancing it with a special sparkle. If you crave even more sparkle, try the AB Fully Coated or AB 2X coating, which are the most brilliant shines available. Featuring Swarovski 5328 Xilion Bicones in Topaz Satin Necklace and Earring Set. This beautifully simple Bicone necklace and earring set is designed with the Topaz Satin Coating, which mutes the original color slightly accenting each bead with a light silvery finish for more of an antique look. Swarovski Topaz Blend Beads have a unique quality where half of the bead is a topaz color and half is a clear crystal, resulting in a complex interplay of colors, shadows and a crystal effect. Topaz is naturally infused with hits of yellow, golds and brown towns that combines very well with Crystal Copper, Crystal Chili Pepper, Crystal Golden Shadow, Light Colorado Topaz, Light Smoked Topaz and Smoked Topaz to name a few. Working with her hands and designing jewelry has been a part of Sheri’s life ever since she can remember. She has been fascinated by designs, shapes and color. The journey of making jewelry has been an overwhelming joyful experience for Sheri and she would feel honored to custom make pieces for people and the special occasions in their life. Pure luxury, in every sense of the word. A beautiful handmade Swarovski Crystal Volcano Rivoli cut bracelet with high quality settings and Swarovski Xilion Bicone Beads in Topaz for added sparkle and shine. The Volcano Rivoli Crystal has 16 different facets coming to a point in the center of the crystal adding even more depth and faceted color play. It has a marvelously romantic, classic look that stands out from the crowd and is truly mesmerizing. Stunning Swarovski Electra Coated Crystal Baroque Pendant earrings accented with Swarovski Crystal Ruby AB Bicone Beads and wire wrapped with antique gold finish for added flair and drama. Electra is saturated with multi-hued glints of blue, pink, purple, green and silver to exude shades of dramatic brilliance. This lovely and very unique Swarovski Erinite Aquamarine Satin Coated Cushion Cut Crystal Pendant necklace is accented with Swarovski Crystal Xilion Bicone Beads in Aquamarine and Erinite for extra sparkle and shine. Aquamarine is the March birthstone color which is an exquisite hue of soft Caribbean blue water reflecting a crystal transparency, resulting in a beautiful pastel azure-like quality. The Satin coating is a lovely effect that adds a soft silvery shimmer which slightly darkens the original color, creating a subtle vintage appearance that is very popular in the fall and winter months. This delightful pair of Swarovski Peacock Coated Crystal Baroque Pendant earrings accented with Swarovski Crystal Golden Shadow Xilion Bicone Beads is a one-of-a-kind style. The Peacock coating mimics the natural colors in peacock feathers, sparkling with rich shades of greens, blues and coppers. This bridal collection piece is comprised of many facets of Authentic Swarovski Crystals. Each cluster is individually wire wrapped on custom fitting snapeez. Swarovski White Pearls, Rhinestone Rondelles and Xilion Bicone Crystals alternate to give sparkle and luster. Simple and elegant, this piece is perfect for your wedding day and is designed for all necklines.